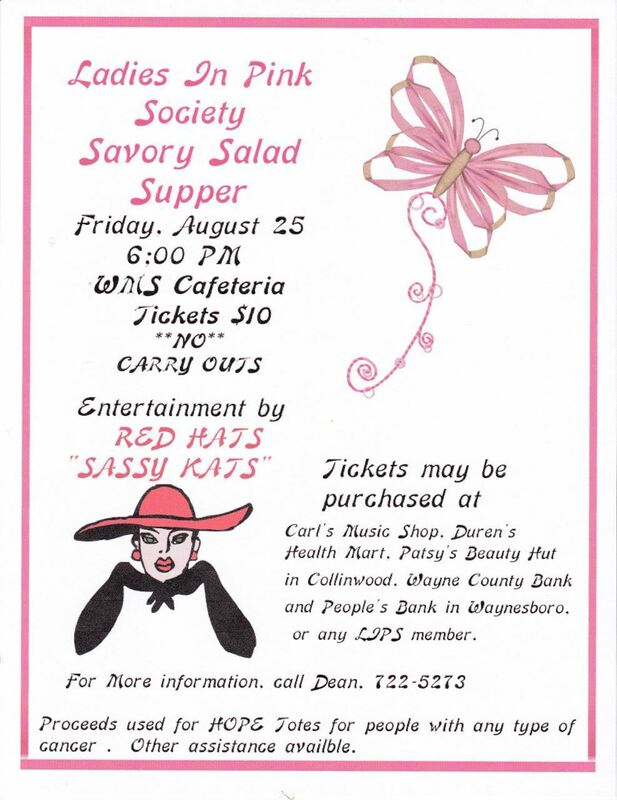 Ladies in Pink Society Savory Salad Supper is slated for Friday, August 25, 2017 at 6:00 p.m. at the Waynesboro Middle School Cafeteria. The event is being held to raise monies to provide items for Hope Totes for cancer patients. Other assistance available. Dinner fee of $10. No take outs. Tickets may be purchased at Carl's Music Shop, Duren's Health Mart, Patsy's Beauty Hut in Collinwood, Wayne County Bank, and Peoples Bank in Waynesboro or from any Ladies in Pink Society members. Entertainment provided by "Red Hats Sassy Kats" Society. For more tickets or more information, please contact Dean Stegall at 931-722-5273. Follow us on Facebook at Ladies in Pink Society.